In the middle of Karelia's Lake Onega sit churches that rival the great medieval cathedrals of Europe. 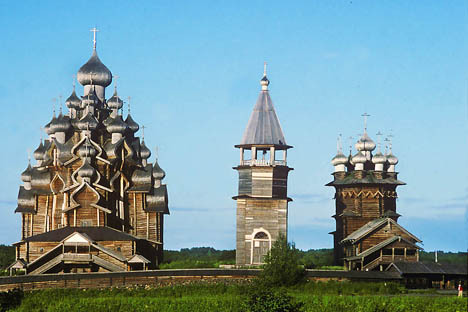 The forests of northern Russia, between Lake Ladoga and the White Sea, were once dotted with great ensembles of log churches. Now only a few precious examples remain, of which the most remarkable is located on the small island of Kizhi, one of almost 1,400 situated in Karelia's Lake Onega. Detached from the mainland, the island has long been known as a sacred space. Its unusually picturesque setting exists within a length of only 6 kilometers (3.7 miles). Yet this beauty alone would not have saved the site from the decay and vandalism that destroyed so many other masterpieces of wooden architecture. For over a century, the efforts of some of Russia's leading preservations have ensured the protection of this legacy. In 1966, Kizhi achieved the status of a national architecture and historic museum; in 1990, it was designated a UNESCO World Heritage Site. Kizhi Island now contains some of the oldest surviving examples of Russian log buildings, including one small church--the Resurrection of Lazarus--dated perhaps as early as the end of the 14th century. The supreme example of Russian wooden architecture is Kizhi's Church of the Transfiguration of the Savior, built in 1714 ostensibly in honor of Peter the Great's victories over the Swedes, although a Transfiguration Church had existed at Kizhi since at least the early 17th century. Located on open space in the southwest part of the island, the church formed the center of a pogost, a term which by the 18th century had come to mean an enclosed cemetery with a parish or district church. As with St. Basil's on Red Square in Moscow, the main Kizhi church, with its many domes, produces an impression of overwhelming profusion and complexity; yet the design derives from rigorous structural and aesthetic logic. Its soaring pyramidal silhouette (37 meters high) signifies consecrated ground from a great distance, and the design of the structure reinforces that symbolic purpose at every point. The core of the Transfiguration Church is an octahedron, rising in three tiers and buttressed by extensions ("arms") at the four compass points. These extensions are also stepped, thus providing platforms for additional cupolas: twenty on the structure, plus one at the top and another on the east side above the apse. This intricate pattern of cupolas and log structure is emphasized by the natural properties of the different woods: the dark walls of aged pine logs and the brilliant silver of the cupolas, covered with over 30,000 curved aspen shingles tightly fitted over the cupola frame. The design of this elaborate superstructure provided an efficient system of ventilation to preserve the structure from decay. Yet as was typical of tall wooden churches in the Russian north, the tower was not visible from the interior, which was capped at a low level by a ceiling painted with saints and archangels--known as a "sky" or nebo--over the central part of the church. This "sky" provided a culmination to the religious imagery of the icon screen in front of the altar. Unfortunately this particular "sky" at Kizhi was lost during World War II, and we know of its form only through black-and-white photographs. The Church of the Transfiguration was intended for use only during major church holidays in the summer. It was not uncommon in Russia to have paired churches, for summer and winter. At the Kizhi pogost, the adjoining "winter" Church of the Intercession, built in 1764, provides an admirable visual complement to the ensemble. Whereas the Transfiguration Church soars, the Intercession accentuates the horizontal, with an extended “refectory.” Its crown of eight cupolas surrounding the main cupolas at the top of its octagonal core is a dramatic and satisfying resolution that enhances, rather than competes with, the form of the Transfiguration Church. The final element of the original pogost ensemble at Kizhi is a bell tower with a tent roof between and in front of the two churches. Originally built in the late 18th century, it was rebuilt in 1874 and renovated most recently in the early 1990s. The pogost, with cemetery, is enclosed by a low wall of horizontal logs on a base of fieldstone. The middle and northern parts of Kizhi also have their chapels, brought to the island from villages in the surrounding area. All of them have the modest charm and beauty characteristic of traditional Russian log architecture for places of worship, with decorative carved end boards and small wooden cupolas. The most striking of these buildings is the 18th-century Chapel of the Three Prelates, originally from Kavgora village in the Kondopoga region of Karelia. The small structure culminates on its west end with an octagonal bell tower. In departing Kizhi Island, the soaring forms of the Church of the Transfiguration are again visible. Although less known than the great Gothic cathedrals, it is their equal as a daring expression of the spiritual impulse in architecture. The Transfiguration Church is now undergoing a thorough, complex restoration that will enable it to survive as one of Russia’s defining monuments.